Good riding quality above 2000ft in the Ripinsky, Jones Gap, and 3920 / 7-mile saddle areas today. Toured multiple aspects in multiple basins and only found one area of clear red flags: some cracking/sliding of recently wind loaded soft slab in one pocket. As a result, there were more wind loaded areas that we avoided. Backed off of two steep/high-risk lines in favor of more manageable lines that were holding a snowpack with good strength and structure. In one steep couloir, we found easy shears (CT5) on a crust-facet sandwich about 20cm deep. 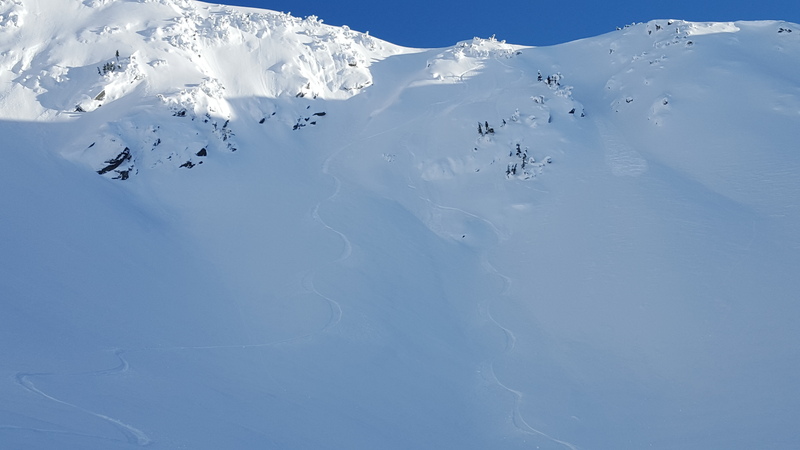 Needless to say we did not ski this line! Most other areas were holding good soft snow over a firm/crusty base that was well bonded to a strong midpack. South aspects were baking in the sun pretty good and even the supportable crust under the new snow was softening by late afternoon. Some rollerballs coming off trees/cliffs but no wet slide activity or other notable avy activity. We avoided: steep wind loaded areas, and sunny aspects steeper than 35 degrees.